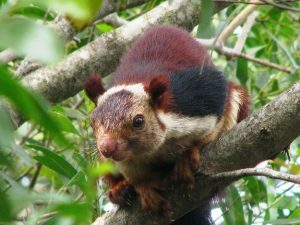 The Indian giant squirrel, sometimes called the Malabar giant squirrel, is a large species of tree squirrel endemic to India. Size: The head-body length in adults is 10-18 in (25.4-45.7 cm). Weight: They weigh around 3.3-4.4 lb (1.5-2 kg). Tail Length: The tail length for Indian giant squirrels is 2 ft (61 cm). Color: Variable from a brown to dark red, undersides have white fur. There is a white spot found between the ears. 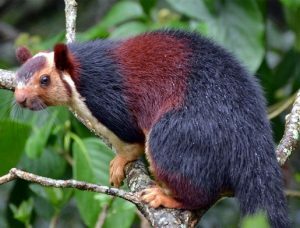 The Indian giant squirrel lives in the moist tropical forests of Peninsular India at elevations of 590-7,546ft (180-2,300 m) above sea level. Its range is across the Indian states of Andhra Pradesh, Chhattisgarh, Jharkhand, Gujarat, Kerala, Karnataka, Maharashtra, Tamil Nadu and Madhya Pradesh. Indian giant squirrels are primarily solitary, although some mating pairs have been observed to be staying together. They are an exceptionally cautious creature on the constant lookout for any potential trouble. Being arboreal, they spend almost all of their time in the upper canopies of tall and heavily branched trees. 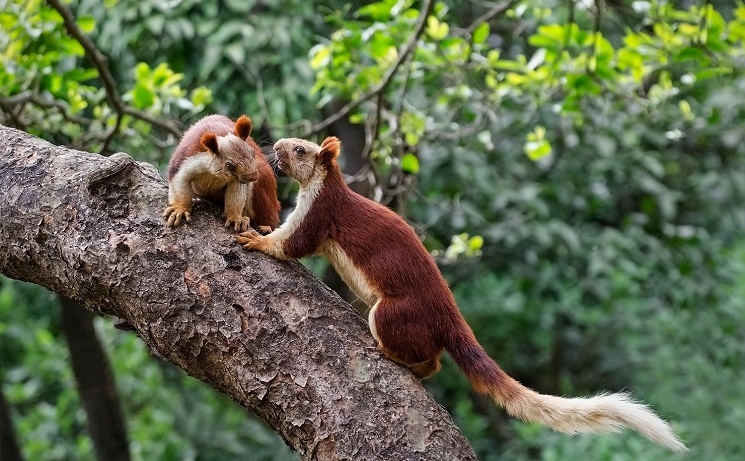 These squirrels are diurnal, remaining active during early morning and evening. They make several nests across their territory and may take refuge in any one depending on proximity. Having a shy disposition, it is rather difficult to spot them in the wild. A peculiar behavior of the Indian giant squirrel is that when it is under duress, instead of leaping its way out of trouble, it freezes before flattening itself along the tree-trunk. To save themselves from predators, these animals build large, globe-shaped nests on preferably thin branches which can support their weight. 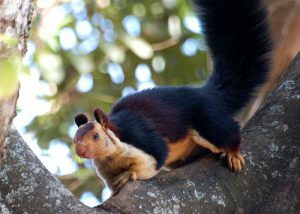 Mating season for the Indian giant squirrel is between the months of October and January. Males compete for mating rights with one female, with the victor getting the first go at copulation. He prevents his competition to engage with the female for at least a few hours after copulation to give an advantage to his chances at paternity. The subordinate male eventually also copulates with the female. A litter of a single pup is born after a gestation period of 21-25 days. Young are born without fur and eyesight. The latter is achieved after 22-26 days. They come out of the nest after 30 days and are eventually weaned at 6 months. They reach sexual maturity at 2 years of age. The maximum a captive Indian giant squirrel had lived was for 16 years, life expectancy in the wild is much shorter. They are a loud species, and their territorial calls are loud and staccato like vocalizations which go on for several minutes before tapering into softer chirps. The most common vocalization of the Indian giant squirrel is the alarm call. Other calls include mating calls, vocal communication between mother and her young, and calls of appeasement. 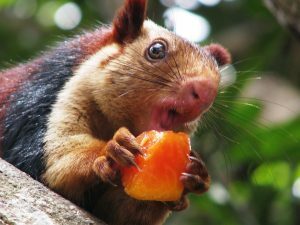 They are omnivorous, feeding on flowers, fruits, bark, seeds, nuts, bird eggs, and insects. It is well suited for its arboreality, with its long tail providing a useful balancing function. 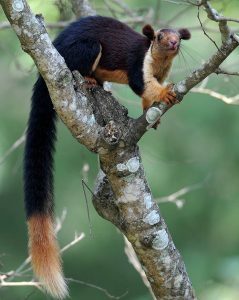 Its hind legs provide the Indian giant squirrel with super-agility, leaping great distances to go from one tree to another. It can also feed while hanging from a branch with just the hind legs. 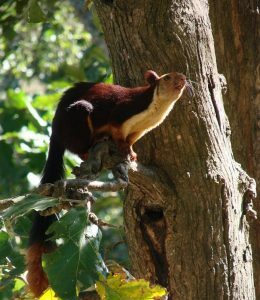 Indian giant squirrels are hunted by various birds of prey like the black eagle, crested serpent eagle, crested hawk eagle, and brown fish owl, as well as apex predators like the Indian leopard. 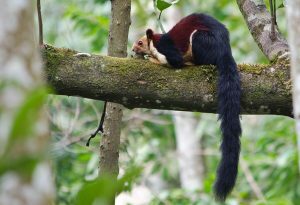 Snakes are also known to have at least tried to prey on Indian giant squirrels. Indian giant squirrels are categorized as ‘Least Concern’ on the IUCN Red List. Severe deforestation across its habitat owing to developing agro-economic advancements is a serious threat to Indian giant squirrel populations. 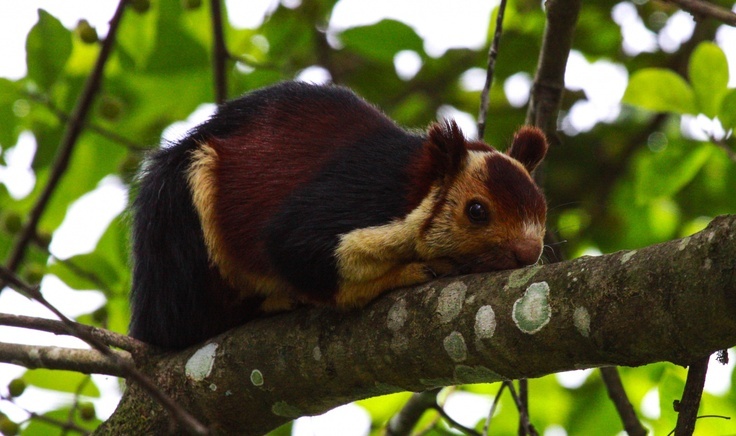 The Bhimashankar Wildlife Sanctuary was set up in the Pune district of Maharashtra to protect the Indian giant squirrels’ habitat. They play an important role in seed dispersal. It is the state animal of the Maharashtra, India where it is called ‘shekru’ in the native Marathi language. These animals prefer to have their individual nests rather than sharing it with their kids.